This is a solid, waterproof, dependable shelter that is incredibly easy to setup. The 3P is good for 2 people who want a some extra room in which to stretch out. The vestibules are enormous, almost too big. This tent is luxurious for a couple who bring a good deal of gear. 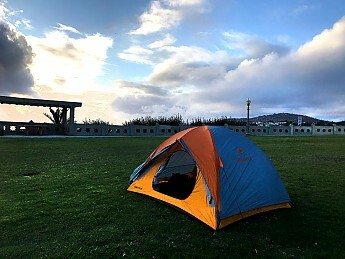 I had tried a couple of higher-end tents but found that the savings in weight did not justify a more difficult setup and tighter living space. With the Limelight 3P we were looking for a happy medium between floor space, weight, and cost. Definitely wanted 2 doors/vestibules, which we've come to appreciate in the wee hours of the forest night when one or the other needs to slip out for a tinkle or spray. The floor space is great for two people, but would be cramped for three. The headroom in the tent is a little lacking compared to more expensive tents with complicated pole structures, but the savings in weight and time to setup is worth it. The tent is extremely easy to set up. Footprint and gear loft are included, which is a very nice feature. With the dome design, the shelter is very stable in wind. The fly is made of polyester, not nylon, which means that it does not sag with moisture. Polyester is slightly heavier than nylon, and marginally more vulnerable to laceration, but we've had no trouble. On the contrary, it's nice to be able to pitch the tent taut and have it remain taut in the morning. The little things like this are worth the weight. The seam-taping is quality, and shows no signs of wear after a couple of years' use. We've had zero rain enter the tent. Once we camped out on hard earth when it rained overnight, and some of the rain had splashed underneath the rainfly and misted the mesh of the tent, but no water entered the tent body itself. The floor and rainfly are solidly waterproof. Lack of ventilation is almost an issue, as with any tent if the conditions are just right (or wrong), but is somewhat impressive for a tent with no vents at all. Condensation has never been much of a problem, though, because any condensation drips cleanly down to the ground off of the rainfly. Due to the non-sagging polyester fly, which remains taut, you don't have to worry about contact with the tent body, or drips coming in from above. The tent is not the lightest out there and does not pack small, and may be better suited for car camping, but we enjoy a more luxurious shelter and don't mind the extra weight and space because we know when we get to camp we'll have not only a dependable sleeping chamber, but also a reasonably-sized habitat in which to sit out a rainstorm or play some cards. It has held up very well after a couple years' normal use. Spacious, very durable, and affordable tent for families without specific demands. Not too good for weight-conscious people or those who already own a tent from premium brand. This review is based on Marmot Limelight 3P tent of 2nd generation, purchased in mid-2015. 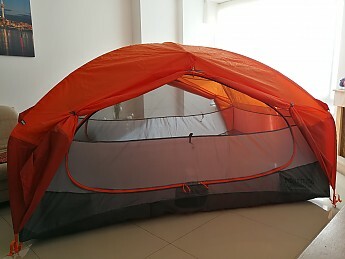 We've chosen this tent for family trips (trekking and bicycle) with my wife and infant son. We’ve already got two double tents of excellent quality (MSR Hoop and Big Agnes Seedhouse SL2), and our aim was purchasing the 3-person tent of same quality. 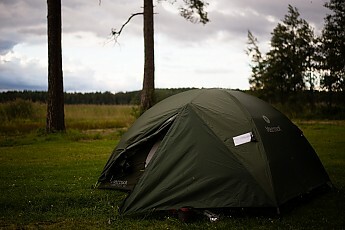 We didn't want to go ultralight, and the warm inner tent was our priority (as we live in St. Petersburg, Russia), so it was a difficult choice between Limelight 3P and MSR Elixir 3. 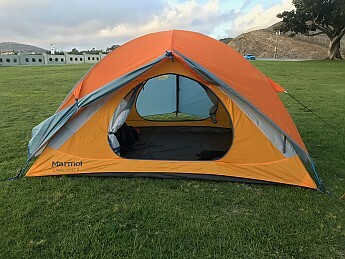 Marmot has won due to its mainly fabric inner tent construction, green color, and slightly better space-to-weight combination. 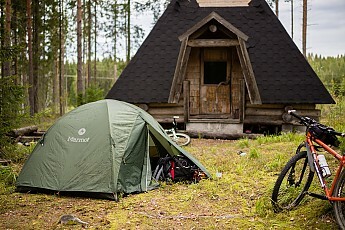 After a year of use, including a 14-day wilderness bicycle trip to Finland, I can say that this tent is a direct equivalent of good pickup truck. Quality, price, room and storage space — a good choice for most rational people. This tent has an excellent internal space for its weight and fabric strength, classic design and good storage abilities. But it is a "truck" rather than a "premium car". The tent allows placing exactly three 50-cm (20") sleeping pads (in very tight fit), so the advertised width of 168 cm is very optimistic. No questions to water resistance, the tent endured several heavy rains without any leaks. The free gear loft and footprint are a nice addition, but the latter may be useful only for car camping, because the floor is already very strong. The most noticeable disadvantage is the tent ventilation. Large mesh panels are located too low on walls (near the head of sleeping person), so it’s quite cold to sleep in this tent even at +10°C (+50 °F). It was necessary for us to cover these panels in sewing workshop by breathable nylon fabric (yellow patches on photos). On the other hand, the tent ventilation in warm weather is not enough, mainly due to lack of vents in outer tent. The condensation is a huge problem with this tent. Especially when you try to exit the tent in the morning — consider wearing the waterproof jacket for this (or wiping the outer tent with cloth). Another problem is poorly designed tent entrance. The inner and outer doors of this tent are opening in opposite directions (only the right side of vestibule may serve as a door). It means that you cannot exit the tent without fully opening the inner door, which is quite frustrating. Also the clips holding all the doors in opened position are very difficult to operate in comparison to MSR and Big Agnes. 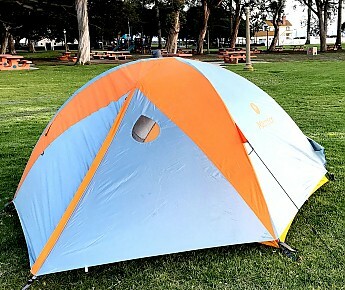 When I compare this tent to my lighter tents, I notice the items which could be lighter without sacrificing any strength: poor stakes (shall be changed to Y- or V-shaped ones immediately), oversized zippers of mediocre quality, too heavy fabric of outer tent and stuff bags, oversized clips and hooks. These accessories could have saved about 100-200 grams (up to 0.5 lbs) if replaced properly. But we need to remember that the Limelight 3P is a simple family tent. I wasn't satisfied with this tent by 100%, so I chose to replace it to Hilleberg Kaitum 3, which offers a much better value (at terrifying price, of course). But I think that the Limelight 3P is an "okay" tent for most families who don't have special demands (and who aren't "spoiled" by high quality tents, like me). Welcome to Trailspace, Vladimir! Thanks for taking the time to share such a helpful first review with us. I hope you'll consider reviewing your other tents. I enjoyed your pictures too. Are they from your bicycle tour in Finland? Thank you. Yes, these photos are from Finland. I am going to write reviews for other my tents and some equipment, it's not a problem. Great, Vladimir! I'll look forward to reading those, and seeing more of your pictures. Don't worry, I have lots of gear to be reviewed. What about the products which are not listed on your website? For example, Primus Primetech Pot. I don't normally take the time to write reviews, but I have to for this tent. Perfect tent for avid backcountry travelers to weekend warriors. 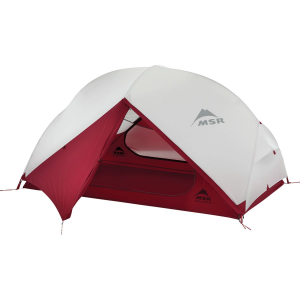 Tent is functional, durable, and easy to set up. I've been using/abusing it for eight years and the tent is going strong like it was its first campout. Highly recommended. This tent is the real deal and has made me a Marmot tent customer for life (much respect to Mountain Hardwear though). I've thought of every possible way to give this tent 4.5 stars, and I cannot do it. Easy, easy setup. Quality build. Durable waterproofing. My wife and I got this tent as a wedding present eight years ago. I am an avid camper and use this tent for backcountry trips (backpacking and canoeing mostly). This tent works/looks as good as it did the day we opened it...no joke. For one anniversary, we took this tent camping and accidentally pitched the tent in a low spot. At about 3 a.m., it started downpouring. Soon enough, the tent was surrounded by water (let's say an inch or two deep). Not one drop of water got in the tent. We were basically sleeping on an air/waterbed at that point. We looked at each other, chuckled at the fact, and went back to sleep. When we woke up, there still wasn't a drop of water that had penetrated. On another trip into the Tetons, we set up near the top of a 300 ft cannon wall. During the night the wind picked up to about 60 mph and woke us up. Of course, we had tied the tent down beforehand, but after listening for a minute or two, we knew the tent/we were in good shape and slipped back to sleep until morning. If it's hot out, you can easily open both vestibules or tie them back to get a cross-breeze. 1. The double vestibule makes this tent a must have for campers with bladders. Whether you camp minimally or often, it is nice to be able to exit "your side" of the tent in the middle of the night without waking your tent mate. 2. When you're coming back to the tent and it's rain, the double vestibule allows both people to remove shoes/gear at the same time on their respective sides. I see that some people deduct on the rating because the tent is rated 3-person and it only fits 2 people with some gear comfortably. Clearly they are unaware of the fact that the per tent rating system is an actual (square foot) metric, not an arbitrary number that each manufacturer comes up with. It's like being upset about the nutrition label on a box of food because "your diet" exceed the standard 2000 calories per day standard. Anyway, if you are looking for a comfortable, functional (3- to 4-season) tent for two people, I highly recommend the Limelight. Welcome to Trailspace, Eric! Thanks for sharing such a helpful first review with us. Do you have any pictures of your Limelight you could show others in your review? Heading to the Boundary Waters in a few days for a week long trip...should definitely have some solid pics when I return. Looks like a beautiful camping spot, Eric. 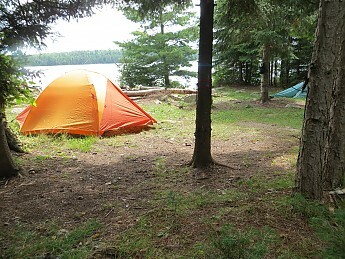 I’d like to add to this review that the tent withstood 55+ mph winds/storm for 1/2 hour in the boundary waters this summer. I’ve been beating on this tent for 9 years now. The teardrop windows (no longer offered) had to be resealed but the tent held up without any issue during the storm. I was really impressed considering we had to find a small cave to avoid the trees crashing down. Thanks for the update, Eric. Sounds like the tent is holding strong. You may already know, but you can also update your reviews directly whenever you see fit. Source: I got it in a trade, it was in "like brand new condition". 2013 Version. Excellent straightforward design and quite decent ventilation despite no vents in rainfly (the design relies on high skirts of rainfly for ventilation and zero obstructions for air flow in resultant plenum). Even though the design allows good airflow from skirts, I would like vents in fly. I am an older guy and re-entering camping and tents and found the setup went very well. Experienced tent users put this up in ten or less minutes. Takes me thirty, oh well, age... :) Also the fact I'm not experienced. 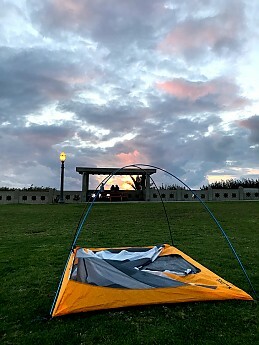 I recommend practicing on all tents, and I have practiced with this Limelight 3P setting it up in a park near the ocean, and get faster and better each time. It's clearly obvious, no tricks. Also, EVERY time I set it up there were strong winds. So, an old guy that's a novice could still set up the tent in such conditions, which is cool. It pitches tautly and appears quite stable, although I watched it, experienced it, in pretty strong gusts on a cliff over the ocean. The headroom is reasonable, not huge, but a comfortable not claustrophobic roomy space for a 3P which, as is classically the case, is best for two people and a child and/or medium sized furry hiking partner. I am 5'9" and can sit up easily in this Limelight 3P. It is easy to pack, fits in its case, and zero problem there. I try to take things out of pack at home, dry them out, and not overstuff things back in pack if there is any chance of trapping moisture. Everything worked great, but worth noting the stakes are the slender metal ones that bend easy and are easy to lose in even fairly short grass, or leaf or twigs on ground. I recommend backup stakes. Because I am not a younger experienced hiker I cannot offer wisdom from that perspective, but for an older person, I found the tent excellent. 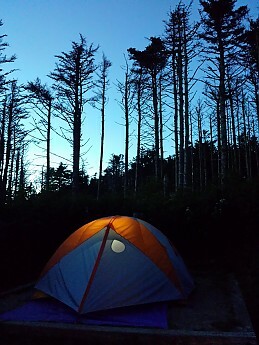 I have unusual strong experience with tents and the wilderness, but in a rather narrow though deep focus in that I lived in a small dome tent on the top of a ridge with radically high winds in the Big Sur wilderness for 3/4 of a year. So, this gives me a certain unique perspective, while having excluded the need for constantly breaking it down and setting it up, thus I'm less of an expert in judging speed of setup in comparison to other tents. However, having lived in a tent in the wilderness, I can say that this Marmot Limelight 3P would definitely work in that situation, and based on quality of construction and strength of, to me, lightweight material, I would trust it better in storm conditions than the tent I lived in, which was a thirdhand tent, and probably like a simply designed Ozark Trails or the like, and yet the design seemed to be heir to all the design work done in Sierra Designs and the whole tent breakthroughs of the late '60s and 70's with Buckminster Fuller's Geodesic Dome Designs having catalyzed a lot of young alternative thinkers who went into designing and building the next generation of very lightweight gear. As mentioned in my review title and opening notes and pros and cons, the only possible detriment is that there are no vents in the fly. It relies on the high skirts to scoop up air and then the structure allows full airflow, rather than being dissected by full fabric sleeves dropping from the poles to the inner tent, which can stop air flow causing less ventilation. This is clearly part of the design. One person mentioned that one problem he had with this model, which he otherwise loved, was that in situations with lots of horizontal wind and dust (maybe Burning Man type situations... high winds on desert or dry lake beds or powdery dust terrain) that the dust blow in under the skirts of the rainfly and the low mesh windows in the inner tent allowed the dust to hit one in the face in their sleeping bag. That man, mentioned he still liked the tent so much that he developed some type of modification to prevent this vulnerability. In the hundreds of reviews I read of the tent, I believe I only encountered that one man who pointed out this vulnerability. I wish I knew why I did not encounter any other complaints on that issue. I will try to hunt down that review, particularly to see what his "fix" or "cure" was for the problem. Again, I have read hundreds (or scores of) reviews, and never encountered anyone else mentioning that. 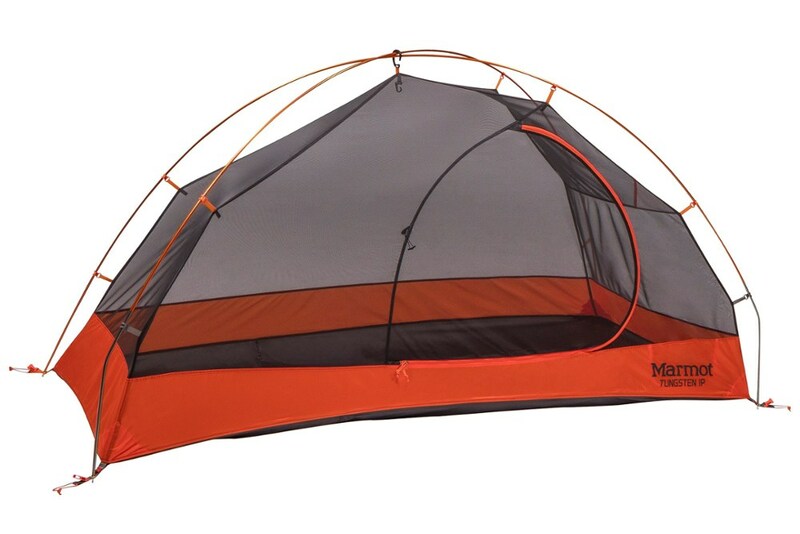 It does reference that the mesh windows ARE LOW in the main body of the tent. I believe this is perhaps the design concept as to why the designers strategized that they did not (and they are possibly quite right as this tent, and this year issue, is clearly very very popular) need fly vents..., i.e., that the air movement coming in under the skirts could almost directly ventilate the inner tent. For me the tent is great. For whatever this is worth, the tent is also aesthetically impressive with its simple form-equals-function look. Nice to come home to. :) Or go camping with. Nice review, Rory! Thanks for taking the time to share it and your pictures. thanks Alicia!!! you all have a really great site. as said before, a true service to the net, which means to many many people. thanks! Thanks for the kind words, Rory! I'm glad to know Trailspace is a valuable resource for you. Thanks for contributing your own reviews towards that mission. After 25 years I finally retired my Moss and searched for a new tent. 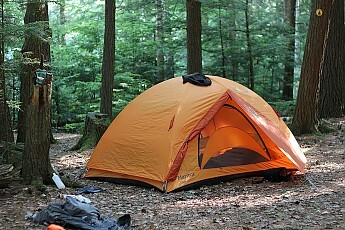 I selected the Marmot Limelight 3P after reading previous reviews and examining the tent the in the local REI store. After several uses I can say that I made a great choice. Everything I wanted in a 3-season tent. I was looking for a tent to replace my 25-year-old Moss Olympic. It had served me well but it was time to move on. I was looking for a roomy 2-person tent that would be used for car, bike and kayak camping. It needed to be waterproof in extreme rain conditions, have the ability to withstand heavy winds and be easy to set up. I also wanted a free standing tent. I chose the Marmot Limelight 3 after viewing it at the local REI store then following up with reviews. Quality is very good this price point and the layout is very well thought out. Doors and vestibules on both sides are very nice when two people are involved. When by myself the one side is a great place to store gear while using the other side to exit and enter. I spent three days where it rained steady with several hard downpours. I stayed completely dry. What I liked was that even when leaving the tent water that was on the tent did not drip in when the fly was opened. Easy to set up and loved the inner ceiling net. Cold Friday night setup in the dark. 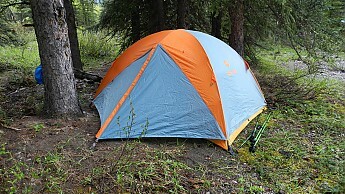 I was testing this tent as a Ranger for The Dyrt at Bear Springs Group Campgrounds in Mt. Hood National Forest. Two-minute setup. Love this tent. It comes with a footprint (hate it when those are sold separately). What is normally a few separate poles is just a one-pole-unit-hooked-together, making it a snap to set up quickly. The entire inner ceiling is a net. Really opens it up and can't wait to hit a clear camping star filled night. Welcome to Trailspace, Kevin. Thanks for the review. Welcome to Trailspace, Kevin! Do you have any pictures of the tent in use, you could share in your review? Also, can you explain more about your role at The Dyrt, perhaps in your profile? Thanks. Thanks for the video, Kevin. Hi again, Kevin. Did you buy this product, or were you given a sample for testing from TheDyrt.com? We get a lot of samples to test at TheDyrt.com but this one was a personal purchase by me. I bought it at Outdoor Mountain Community (OMC) on Sandy in Portland Oregon. Thanks for confirming that, Kevin. And thanks for sharing your first review with us! I love this tent! 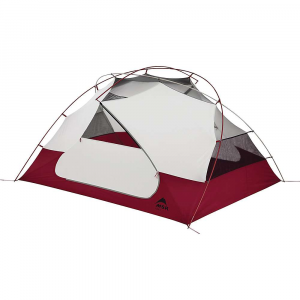 Very solid construction, waterproof, and spacious for two people pus gear. I often use it solo and I don't have to store any gear in the vestibules. Ventilation is great and very easy to set up! Excellent customer service at Marmot! Design, materials, and construction are really top notch. Super easy to set up, and if it's raining, you can set up the fly and the (included) footprint only, first, and then clip the tent body to the poles while you are all dry, under the fly. Nice thinking, Marmot! The other thing I LOVE about the Limelight 3p, is that the fabric of the tent, the floor, and the fly are NOT made of super, ultra- lightweight materials!! In most cases, lightweight materials = very easily damaged, very fragile, and an overall very short lifespan. I like things that are DURABLE over many, many years. I'm not a tag-cutting, "gram/ounce counting" kinda guy. I am always willing to sacrifice weight for comfort, but never the other way around. A great tent for the price and totally worth the investment! Very importantly, Marmot has excellent customer service. I can actually talk to someone with NO accent on the telephone! Wow...what a concept!! It's super nice to be able to call and talk live on the phone to get an issue resolved, or to just ask a quick question. I'm really not a fan of going onto a website and for customer service I have to do a "live chat"..........really????? My time is too valuable for that. Thank you, Marmot! A great company and great products! Nice review. Welcome to Trailspace. Thanks GOOSE, I appreciate it! Trailspace is a great site and I am really enjoying it! Big fan of Marmot gear. Nice write-up Lee! Thanks for the review, Lee. Where was that pretty tent shot taken? Thanks Alicia, the photograph was shot near the summit of Mt. Mitchell, NC. It's the highest point east of the Mississippi River. This campsite was at approx. 6300 feet. Temps were in the low 40's F in August! It was great to get out of the Atlanta heat for a few days! Thanks, Lee, for the review and photo info! Way to heavy for a 2P tent. I'll still take my Tarptent Scarp 2 W/X-ing poles. Hi 300winmag, my review here is of the 3 person Limelight, not the 2p. This weekend I'm snow camping in my VE25.....talk about heavy LOL......... and worth every ounce too. Lee, My bad. Didn't notice the 3P designation. A 3 person Limelight at that weight seems reasonable. And the dome shape will withstand snow loads and winds very well. Hi 300winmag. No biggie :). Your 2p tent sounds cool. So you use only trekking poles to set it up? Sounds really lightweight! What a great idea. Lee, my Tarptent Scarp 2 uses one main hoop pole OR 2 more crossing poles that I have moved inside the fly in a custom mod for better fly support. 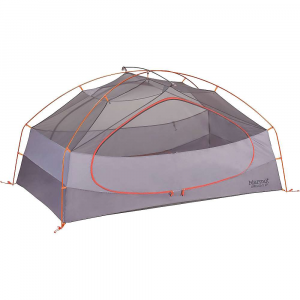 Awesome tent at a good price, and has the quality you should expect from Marmot. My wife and I (and dog) used this tent for only one year. It is fantastic, and the main reason for this is the ease of setup. Two poles, that bungie themselves together, plus one small pole for the rain fly. We had the version prior to the pole color coding, so for those with the newest version, setup is even easier as the poles match the color of the clips in which they go. It comes with the rainfly, floor, very light stakes, guy lines, mesh gear hammock. We had adequate room fitting the 3 of us into the tent, btw our dog is about 60lbs and likes to sprawl out when he sleeps. There's not really any room for packs unless you use them as a pillow or under your legs. When looking at tents, at least for car camping, I always like to size up a person to make room for gear and amenities so everyone is comfortable. Backpacking is another story. Packability, well if you split the components up or at least account for multiple people on a backpacking trip, you could get away with using this tent. In the bag it comes with, it's quite tall, so I'd split it up between people or at least make it more packable in one persons pack. Again, for car camping, no big deal. The weight isn't too bad either, when you jump up to the 4P, that is just too much to carry when there's much lighter tents on the market purpose built for backpacking. The tent held up well in the rain and space available in the vestibule areas is great for shoes, boots, and packs and will keep them dry. Taped seams and plenty of ventilation make for a pleasant experience when the weather isn't. I would definitely recommend this product, but honestly we did end up selling it. But only to get the larger Limelight 4p to make room for our growing pup. Amazingly easy to set up (under 5 minutes). All the gear build is of great quality. The zips are free moving and the poles are excellent. There is so much room inside and the vestibules come on both sides so the protection this tent offers from the elements is tremendous. The pack down is super easy and putting the gear away in the bag is a breeze. Welcome to Trailspace, Jared! Thanks for the review. How long have you had your Limelight? Simple setup, thoughtful design. 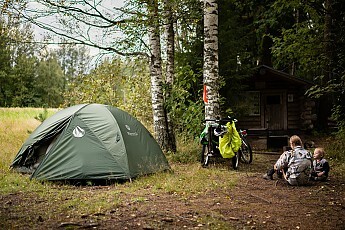 This will be our new bike touring tent. Product does not come with enough pegs and guy cords to set up as recommended by Marmot. 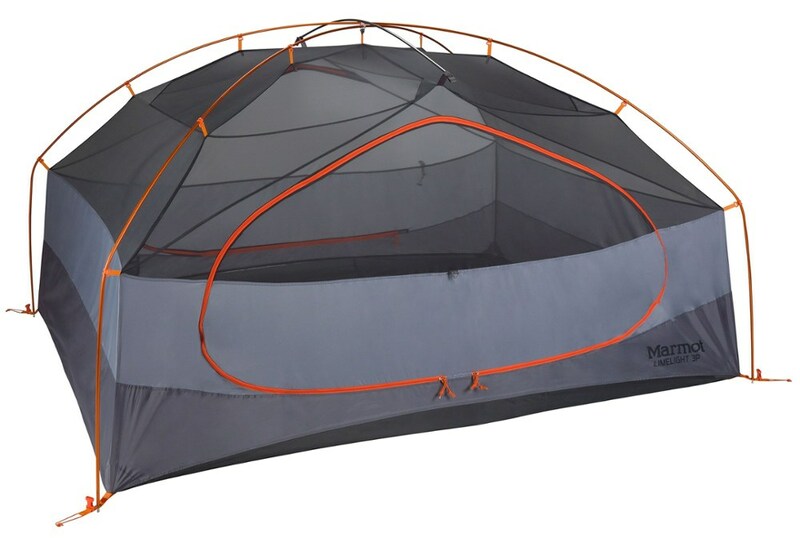 To erect this tent as shown in Marmot's own YouTube instructional video requires 12 pegs and six cord/toggle sets. Marmot provides only 9 pegs and 4 cord/toggle sets. WTF? Marmot's own customer service rep told me that you would only "rarely" need to pitch the tent with all the gear. Anyone who has been out there knows that "rarely" happens regularly, and that you prepare for the worst scenario. Very easy setup, pretty durable, it survived two kids playing in it all weekend. Well made, great value for the price. Got it on sale for $260, regular price is $325 (in Canada). Very satisfied with purchase. This is a free standing tent that is super easy to set up. The two poles have a hub in the middle that make it possible to set up with one person (although I did knock down several pictures on a table in my living room, don't tell my wife!). The tent pitches very well and is taut, making it fairly quiet in the wind. The rain fly has adjustable plastic buckles so you can get the fly tight over the top of the tent. It was warm and humid during the day (80+ degrees) and cooled down to about 65 degrees at night. The tent was practically condensation free in the morning with two adults sleeping in it. The tent says it is a 3-person tent and I guess if you want to share warmth or be really close to two other people it is. I'd say it's more of a 2-person. It fits two sleeping mats and two backpacks at your feet with a little room to spare. However it does come with a gear loft, which is very handy, and gear pockets on all four corners. Headroom is very good. I'm 5' 10" and had no problems with room inside the tent. The tent packs down to a good size and can be used without the actual tent! It can be pitched with just the footprint, poles, and rain fly. I haven't tried this, I just saw it on a youtube video on this model. Although I've only used this tent twice it's been great. It had two kids going in and out of it 500 times a day. The zippers worked perfectly. The only suggestion I would make (and this extends to all tents and sleeping bags) would be to include glow-in-the-dark zipper pulls. I just got back from a backpacking trip where it rained torrentially for two hours and continued at a normal rainfall all night, at the height of the torrential rain this tent was sitting in 2 inches of water and didn't leak a drop!! GREAT TENT! Perfect size for two plus gear. 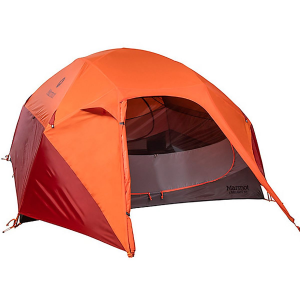 Great backpacking tent; yes, there are some that are smaller and lighter but we got a great deal on this one and we wanted a little extra space to store our gear inside so the Limelight 3P is perfect for us. The two vestibules on this tent are quite large, great for keeping wood or extra gear dry. It's also a little longer than other tents we were looking at which is something we appreciate. We have used it quite a few times now, under rather adverse conditions and I can't say how impressed I am with the construction. It's very easy to set up and take down — Bonus! We have found it easier to break up the components of the tent and split them between our two packs instead of having all the pieces (ground sheet, tent, fly, poles and pegs) stuffed into the original bag and then try stuffing it into one pack. But maybe that's just us? Another bonus are the two doors, no more crawling over the other person to get outside! During our spring backcountry trip we experienced non stop rain for 4 days and eventually a flash flood in the middle of the night (woke up to water rushing around the tent), we packed up in record time and hiked back to the car in the dark - yikes. Bottom line: the tent stayed dry the entire trip! My only complaint is that the tent only came with 9 pegs, definitely not enough to max out the entire tent, fly and guy lines. Overall we are very happy with this tent. Nice review, Dianne. Thanks for sharing it. Great for a two-person backpacking tent. Packs small enough for me. A very quick and easy setup/tear down. Going with the three-person is great for two people. Lightweight for backpacking, with great space inside and outside when rain tarp is on. It has enough room to store two packs plus gear under rain tarp to keep out of the elements. Reflective writing and tie lines help during the night. Great air flow with trap on. Quick setup with clips that attach the tent up to the polls. This feature is great for windy days. You can go from a flat tent to upright and attached in seconds. Great tent for the money — great for motorcycle camping. I bought this tent before a 17000km motorcycle road trip. I used it for about 10 nights and never more than one night in the same camping spot. The tent is very easy and quick to set up even in the dark. The poles are of good quality and all the attachment points are solid. Stakes are cheap and don't do well in anything but grassy grounds. I have camped out in a strong rainstorm, the one that washed out roads in Colorado in September 2013. Water was falling in buckets and the camping spot has more water flowing thru in, around and under the tent, but the rain never came in. Ventilation is excellent, maybe too good. On warm/hot nights it is a peach, but in very cold weather it flows a little too well. Room is good enough for two and a little bit of equipment. It has a net hanging from the center where you can leave your phone and wallet etc. It packs fairly small and light but the poles a just a little bit too long to put in my Givi E41 motorcycle cases. It's pretty durable, nothing has broken on it during my trip. Spacious, sturdy, and relatively light for 2 people + gear. 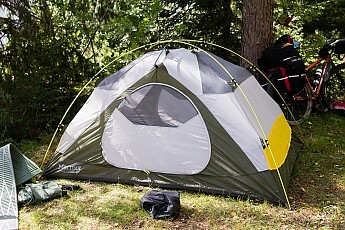 This tent is easy enough to set up solo but goes up with ease if there's a second person setting it up. The seams are well constructed, it stuffs down to a reasonable size and weight for backpacking or (my preference) a bicycle tour, and features two doors and two spacious vestibules. I could cram a third person inside it if necessary, but it's really most comfortable for 2 adults with room for gear and extra clothes around the edges or in the vestibules. I'm 6'2" and have been in some tents that allow me to stand up and others that I'm constantly bumping into while exiting, entering, or moving around. 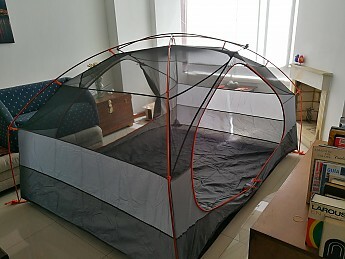 This tent gives me adequate room for changing clothes while lying down, reading, and sleeping with a bit of space on all sides. I like that the 4 built-in pockets are snug with the tent body rather than dangling and causing stress points on the tent. The pockets aren't as big as most tent pockets I've encountered, but the 3-person Marmot Limelight I bought from Backcountry.com included a gear loft and a footprint (which is the same dennier nylon as the floor of the tent itself). Little heavy for backpacking but no complaints from the wife or dog. Plenty of room and great escape from elements. Setup is easy under five minutes. Ventilation is great in the summer and keep the wet out. Room for the wife, dog and our gear. Bulky to pack up, but we split the weight. This is my 3rd Marmot tent in 15 years. I wouldn't buy another brand. Took this out for several hikes, the green variety. Took this out for several hikes, the green variety. It is all in all a great tent. Very easy to deploy and dismantle in minutes even during the toughest of windy subarctic conditions. Waterproofness from nylon sheet is great but is not breathable. Condensation on the inside of the fly is sometimes a little irritating. The tent's windbreaking ability isn't exactly excellent along the floor. A bit too ventilated and chilly at exposed locations. According to my calibrated professional scale the weight is 3600 grams, almost 200 grams heavier than specified by Marmot. Still an okay weight for a 3-man tent, but misspecification is never good. For three persons to be comfortable in this they must be quite slim. Despite these gripes at sub $300 the tent is an excellent bargain and I would recommend it to anyone on a budget. I've used the Marmot 3P for over a year now and it's a great tent. It's comfortable for 2 large guys (6' and 225lbs each) and backpacks very well. The setup is super easy and like others have said is pretty waterproof. I've been in a few downpours up in the North of Saskatchewan. Overall I give it 5 stars. However, the 3P rating doesn't really apply to me and the folks I hike with. I can get myself and one other in there comfortably. Not a problem with the tent, but simply how they rate the tents. I'd totally buy this tent again if they offered a lightweight version. Have used this tent the last year, and it's been great. Have used this tent the last year, and it's been great. It replaced an old Eureka I've had for 20 years. The weight is not bad split between two people and the size is just perfect for the two of us and our dog its just right. With 2 doors I don't have to crawl over my wife to get out in the middle of the night. I love my Marmot 3. It is technically easy and quick to set up or pack it away into the carrying back. All fittings are strong enough and one of the best in my Marmot is the double floor. 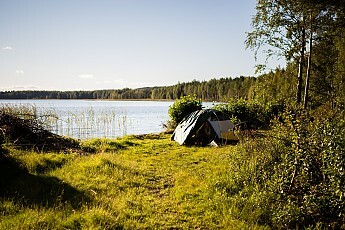 It is excellent for trekking in Lapland. The last but not the least is that it is also good looking. The only thing to criticize Marmot generally is the inside sleeping space. I would have bought Marmot 2 but there is not space enough for two big (100 kg) trecking "bears" with back sacks and different items for cool season trecking, so I bought Marmot 3 which is big enough and I really love it. I have tested it already early summer 2009 in Lapland and late autumn in Gulf of Finland archipelago. Have owned the Limelight 3P for about a year; we are very happy with it. Lots of room, especially with 2 folks, but not so big that it doesn't still feel cozy. First tent I've had with 2 zip doors on opposite sides. This has proven useful. Decent amount of vestibule space as well. I wouldn't backpack with this tent - too bulky and heavy. But it's a great car camping, or short walk in to site kind of tent. And most importantly, my girlfriend loves it! Good design elements overall. This tent is a very good bargain, it comes with the footprint, gear loft, 8 high quality hex stakes, full rain fly, two doors & two vestibules for about $100 less than comparable 3 person models I have seen. It has very high workmanship,every thing fits together logically, is snug and easy to adjust and set up. The two main poles are clipped together and you just assemble them into a X and insert into the corner grommets. Then raise the body and clip to the poles. The rain fly has quick fasteners at the corners with tension adjustment. Peg it down in the corners and one peg each for the vestibules, and you're done. Takes 2 minutes total from bagged to set up. I got it down to 6.6 lbs, (2.2lbs per camper) with all but two stakes, some extra rope,a pole repair section, and tensioners that are included but not needed. It can be fast packed the same way with the fly & footprint only, (if there are no bugs) at about 4 lbs total weight. The vestibules each have a small window. Nice! Drawbacks, This is not a full mesh body so views out, are restricted by ripstop fabric, this is particularly annoying in the doors. Might be nice for some privacy without the fly on? Or make the tent stronger long term? The doors zip down, not to the side. The door & vestibule tie backs are a little clumsy, (I prefer them to be bungies not rope.) Only one side of the vestibule has tie backs, but I found you can loop the stake out to a corner peg to keep it out of the way. Well the Limelight is actually a 3.5 season tent and just went on a 3 day hike in the White Mountains (Liberty, Haystack, Lafeyette, and Lincoln) and it was great. I mean it is a 3 person tent that weighs under 7 pounds. With that said it is kinda big, but it's a 3-person tent. They all are bigger but we still found space for it with a little effort. It rained one night and we didn't get a drop of water inside, and it was very very breathable. We had 2 Sierra Designs 15 degree sleeping bags zipped together and it was like 50 degrees at night so we were very hot and it was not stuffy at all. The only thing I would have liked a little more was if the color was a little toned down. Orange is tough for stealth camping. With that said it was great, more than enough room for 2 people and gear inside. I would guess good room for 3 with gear under the canopy. Plus with the footprint, which is included, you can cut weight by leaving tent at home and bringing the foot print and poles. Let me know if any questions.